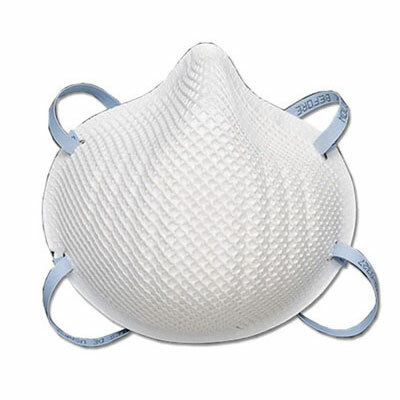 Moldex particulate respirators have a molded nose bridge with soft foam nose cushion that provides the wearer an easy comfortable fit. There's no metal noseband to adjust and the seal is maintained without pressure points. Moldex particulate respirators last longer, so you'll use fewer. The Dura-Mesh® shell, exclusive to Moldex®, protects the filter media so it stays cleaner-looking longer. The shell resists collapsing, even in heat and humidity so the respirator holds its shape longer. The result is fewer respirators used and lower costs. Moldex particulate respirators are useful for a variety of applications. Hot, humid and dusty environments such as welding, soldering and brazing, grinding, sanding, sweeping, bagging, stone quarrying, metal machining, cement, underground mining, polishing, buffing, lime, poultry and textiles. No oils present.